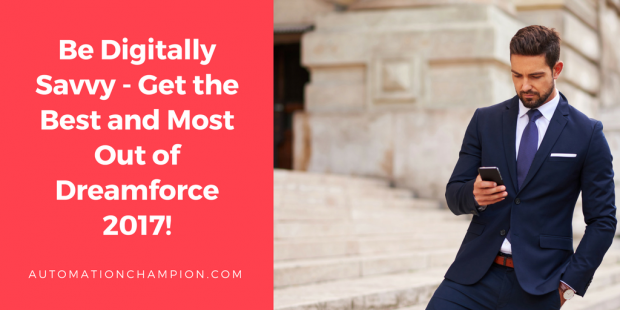 Be Digitally Savvy – Get the Best and Most Out of Dreamforce 2017! It is that time of the year again! Dreamforce 2017 (November 6th – 9th) is just around the corner! At #SalesforceOhana, we can not wait to hear about new Salesforce features; and, we look forward to learning from what others have been doing. Year after year, the event gets bigger – with plethora of acquisitions, the sheer number of new products featured at the event are staggering. I had the honor, pleasure and opportunity to attend Dreamforce (#DF16) and (#DF15). At Dreamforce one meets hundreds of people – some exchange visiting cards or contact information; others, attend one or few sessions to dig deeper in the platform. There is so much to do, with so little time! It is hard to choose between great and super-great activities! How is a kid to prioritize in a candy store? Like most mortals, do you have trouble prioritizing between wants and needs? Or is one of your unmet new year’s resolutions is to become more organized? If your answer is a resounding yes to either of these questions then, read on! San Francisco is a new city for many attendees like me. Now that you are here, where do you stay? What about dinner/lunch? Which Transportation options are cheaper? Safer? Better? Not being a native of San Francisco can pose numerous such, known and/or unknown, challenges. Oh, and finally, how can you return home without some site seeing! Is panic and anxiety setting in! Already? But, wait, we have yet to even consider one of the cardinal needs in this day and age – cybersecurity! Is wi-fi ok to use? How to make sure that your data is secure or that no one is tracking you while using public wi-fi? Whether you are in your office, on the road, or at an event – our trusty small handheld device – aka a mobile phone – quite often becomes our office away from our office. When going to a conference like Dreamforce, it is important to be equipped with the best apps around. Here are top 7 must-have apps that will cover you in almost any situation and make your entire Dreamforce experience better. Why Mobile Apps at Conferences? Before we look at some must-have conference apps, let us take a look at how we got here. Years ago, at conferences, you would be armed only with a pad and a paper – but god forbid, if you forgot to carry either, and if you give in to your temptation to borrow from an acquaintance, you would have just managed to convert him/her into an enemy! Read the rest of this entry!